IRVINE, CA--(Marketwire - October 28, 2009) - Biomerica, Inc. (OTCBB: BMRA), a global provider of advanced diagnostic products for the early detection of medical conditions, today announced their move to a new Corporate, R&D and Manufacturing facility in Irvine, California. 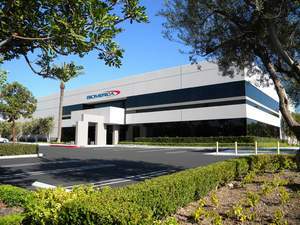 Biomerica's new state of the art facility is the result of a two-year search of possible buildings in the Orange County area. This new facility will afford efficiency, production, and quality assurance improvements. The manufacturing layouts have taken job and process flow into account. The warehouse and refrigeration areas have been appropriately located for optimal work flow. In this new facility, Biomerica will now have the opportunity to continue its growth as a global provider of diagnostic products. The Company expects to complete its move by mid-November 2009. Irvine is one of the nation's largest planned urban communities and encompasses more than 65 square miles. The new Biomerica building is less than 2 miles from John Wayne Orange County Airport and within 4 miles of the University of California Irvine, a leading medical school. The company's new address is: Biomerica, Inc., 17571 Von Karman Ave, Irvine CA 92614. The Company's phone number remains the same (949-645-2111). Biomerica, Inc. (www.biomerica.com) is a global medical technology company, based in Irvine, CA. The Company manufactures and markets advanced diagnostic products used at home, in hospitals, and in physicians' offices for the early detection of medical conditions and diseases. The Private Securities Litigation Reform Act of 1995 provides a "safe harbor" for forward-looking statements. Certain information included in this press release (as well as information included in oral statements or other written statements made or to be made by Biomerica) contains statements that are forward-looking; such as statements relating to intended launch dates, expected improvements in performance, expected product introductions, sales potential, market size, growth of business, favorable positions, efficiencies, work flow, leading market positions, success of product and new product offerings. Such forward-looking information involves important risks and uncertainties that could significantly affect anticipated results in the future, and accordingly, such results may differ materially from those expressed in any forward-looking statements made by or on behalf of Biomerica. The potential risks and uncertainties include, among others, fluctuations in the Company's operating results due to its business model and expansion plans, downturns in international and or national economies, the Company's ability to raise additional capital, the competitive environment in which the Company will be competing, and the Company's dependence on strategic relationships. The Company is under no obligation to update any forward-looking statements after the date of this release.